Here's the list of the 58 Democratic candidates and incumbents who won't support minority leader Nancy Pelosi, D-Calif., for Speaker if the party takes the House in the November elections. "Will I support Nancy Pelosi for Speaker? The answer is 'no,' " Pureval exclusively told Politics Extra on Wednesday. “I’m running for Congress because I genuinely believe we need a new generation of leadership. Washington is Brooklyn ken. It’s toxic, and it’s on both sides." Brendan Kelly (D-IL) [said] should he win in November, he would not support Nancy Pelosi… as Speaker of the House. Salt Lake County Mayor Ben McAdams said… he would not vote for Pelosi to lead the party if Democrats regain control of the U.S. House. Sherrill announced that she would not vote House Minority Leader Nancy Pelosi into a House leadership position if she was elected to fill retiring Rep. Rodney Frelinghuysen’s seat. "We need to change the leadership in Washington. 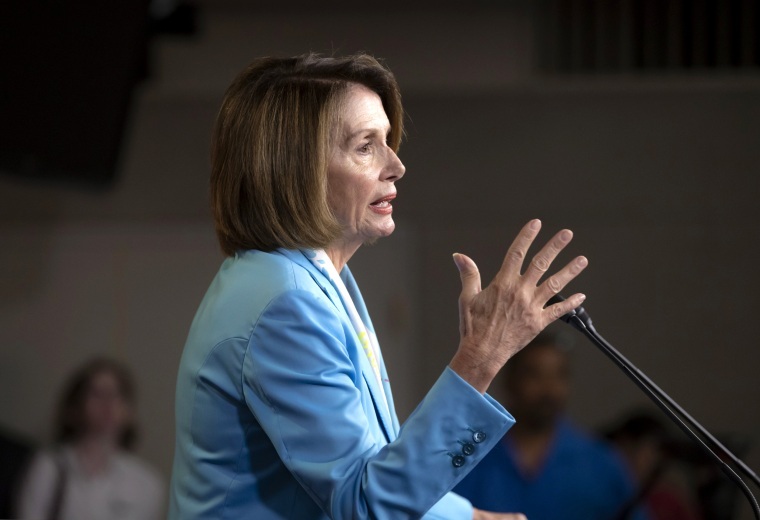 After more than a decade of leading House Democrats as Speaker and Minority Leader, Congresswoman Nancy Pelosi will not have my support as leader in the next session," Van Drew said in a statement. "I'm not supporting Nancy Pelosi…. I think she's done a lot of good for the party; I think she's done a lot of good for the country…. However, I think it's time for a new generation of leaders to go to Washington, and this is with respect to both Democrats and Republicans." “I don’t think she relates to the working class,” Ojeda said of Pelosi. “I look at the leadership, I think we should vote them all out,” Garrett said. “Although this discussion is premature, I would support new leadership in the House,” Gasper said through a spokeswoman. "I cannot vote for more of the same, and I cannot support Nancy Pelosi or Paul Ryan to lead Congress. We need fresh faces and bold ideas leading both parties." "We need new leadership in Washington, on both sides of the aisle, and at every level, from first-term members to Congressional leadership, and for this reason, under no circumstances, would I vote for Nancy Pelosi to again be Speaker of the House." "Both parties need a new generation of leaders who will put country ahead of party. I'm not supporting Nancy Pelosi as leader in any vote because I believe there are people who can better take the Democratic Party and our country forward." KASIE HUNT: Would you support Nancy Pelosi to lead the Democrats if you're elected? CAMPA-NAJJAR: Honestly, no. I think we need new leadership. "I think it's time to move on…. If this blue wave really does happen, it's a request to go a different way, a mandate to do things differently." All but Skinner say they wouldn't vote for U.S. Rep. Nancy Pelosi of California as speaker if Democrats win the U.S. House this fall — an indication they feel a new generation should have a seat at the leadership table. 43. George Scott (D-PA-10) Statement to NBC News (8/13/2018) "It is time for a new generation of leadership." "I really respect Nancy Pelosi and her service and dedication to this country. However, I think it’s time for new leadership in these chaotic and critical times. I would not vote for Congresswoman Pelosi in either the caucus meeting or on the floor." "I would not vote for Nancy Pelosi." "She has been a great leader, but like every leader, time immemorial, it's time for people to know when to go.... I'm sure that Nancy Pelosi believes that she is the one that can lead this party. I happen to have a different opinion, and I think it's important for people in my position to not be afraid to speak truth to power." Rep. Brian Higgins of Buffalo said… that he will not back House Minority Leader Nancy Pelosi of California for another term as the top Democrat in the House. “The focus is on 2018, but I think there is going to be some change, whether it’s newer members or maybe someone not in leadership right now,” said Ryan, who said he still does not plan to vote for Pelosi for speaker if Democrats take the House. A spokesperson confirmed Rep. Vela will not vote for Pelosi as party leader. "I don't really know an answer to this question because when I choose a candidate for any election I look at the candidates," Balter said, "and I don't know who's running… I think we are stuck in the old way of doing things, and we need not only new energy but a new approach,"
Lizzie Fletcher has refused to endorse Pelosi for speaker but has still won support from Emily’s List and other national Democratic groups. [Ortiz Jones] said it was premature to talk about who the next speaker is going to be and promised to to support whoever's "going to be the best person to represent this district and fight for what matters most in this district." Pressed on the question, she said she was waiting to see all the eventual candidates for the job before making a decision, noting Democrats "have no idea who else is running" beside Pelosi at this time. Casten nor Houlahan would commit to voting for Nancy Pelosi for speaker, but they also didn’t rule it out. Both said they would need to think about who got their vote and consider all the candidates for the position. “Lucy will make a decision on who to support for Speaker and other leadership offices when she knows who is running for the positions, whether Democrats have won the majority and she has had a chance to learn each candidate's plan for helping move the nation forward,” a spokesperson said. “If any other political official had done what she has done, but had been male, that question would not constantly be coming up,” Wild said. Still, she stopped short of pledging to back Pelosi... saying she would wait to decide based on the available candidates. "The Democratic Party should be cultivating new talent for its key leadership positions. However, if someone steps forward that does not embody the qualities needed to proactively lead the 116th Congress, then I would consider voting for Nancy Pelosi." “For how many of you is this one of your top concerns?” Wexton asked. No hands went up. She went on to say she hadn’t thought about it at all. Barzee Flores said in a statement that she "hasn't put a whole lot of thought into who would take the Speaker's gavel. But I would say that in the time I've been running there is a clear, visceral hunger among Democrats for new faces and new leadership."